Cops are concerned about people shooting in the city’s streets. The trouble is, they’re concerned about people who shoot with cameras. Photographer Jerome Vorus writes on his blog that he was recently “detained for photography” by D.C. police after taking pictures of a traffic stop from a distance “far enough not to impede in any police investigation.” An officer asked him “for ‘security reasons’” why he was taking pictures and then asked him to produce identification. When Vorus asked if he was being detained, the officer, “after dancing around the question,” said he was free to go. But as that officer left, another approached, told Vorus he was being detained, and told him to put his camera away, according to the photog. In Illinois, a man who recorded his own arrest on a misdemeanor charge -- later dropped -- is facing prosecution for illegal recording, a Class I felony that could get him 15 years in prison. Maryland also has such a law, which was recently used against motorcyclist Anthony Graber. As I wrote last month, that 1970’s-era law was intended to protect citizens against secret recording, but is now being used by those in positions of power to avoid accountability. 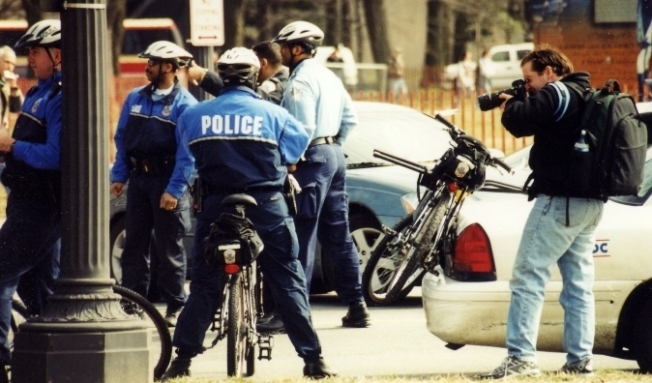 Since 9/11, there have been more and more cases across the U.S. of police arresting citizen photographers without cause. Though some of these citizens, like YouTube’s Jimmy Justice, are trying to document police wrongdoing, others have less political motives. More recently, National Press Photographers Association member Charles Ledford and Carlos Miller of the blog “Photography Is Not a Crime” were, in Miller’s words, “banned for life” from the Miami Metrorail system for taking pictures in a parking lot. While commercial photography or recording is banned in the Miami system, the law specifically protects filming or videotaping for “personal or family use,” as well as news photography. Miami-Dade Transit Head of Security Eric Muntan had told Ledford in advance that “people had the right to take pictures within the Metrorail station,” Miller writes, though he said contracted security guards were permitted to question photographers. Miller says a security guard tried to stop Ledford from taking pictures due to terrorism fears, and refused to examine a printout of an e-mail from Muntan explaining the rules. That guard then “punched out for the day.” A second guard read the e-mail, but “still insisted that we needed prior permission. When we told her that the e-mail proves she was wrong, she barred us from entering the station” until her supervisor arrived.